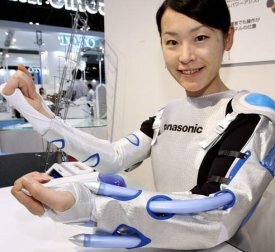 This prototype “power jacket” from Matsushita Electric Industrial (parent of consumer electronics company Panasonic) is designed to help patients recover from partial paralysis. Sensors at the elbow and wrist allow a healthy arm to control the eight artificial muscles, which are powered by compressed air, on the paralyzed side. The 4-pound robotic jacket was on display Wednesday at the Home Care and Rehabilitation Exhibition in Tokyo.